Formero came to the assistance of a Melbourne-based locksmith to develop a new jig designed to cost-effectively retrofit locks. Daniel Lemm runs Rapid Locksmiths, a small locksmith company in Melbourne. Realising the need for a cost-effective jig that could be used by locksmiths all over to retrofit locks, Daniel decided to design and develop the product himself though he had no experience in product design, prototyping and manufacturing of a new product. After designing a plastic jig model, Daniel realised he knew very little about injection moulding or tool making. He was also spending money with patent attorneys, registering the design in Australia and a trading name, Dynamite Tools. Daniel’s confidence to proceed with his product was really being tested with a series of challenges beginning with a moulder advising him that his design would be pushing the limits of moulding and his budget. Finding a toolmaker that would provide timelines and help with his manufacturing problems seemed almost impossible. Daniel contacted a sales technician at Formero, who understood exactly what was needed to successfully produce the new jig. Formero’s ‘Design for Manufacture’ service that minimises the number of production tools to reduce the overall costs was used to develop the product. 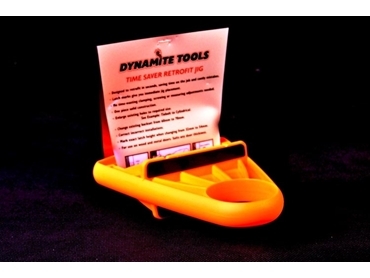 Daniel’s new retrofit jig is now available in Australia and New Zealand, distributed through Locksmiths Supply Company. Formero, a company specialising in rapid prototyping and custom manufacturing has project managers in Australia and China to enable streamlining of each stage of the product development process.